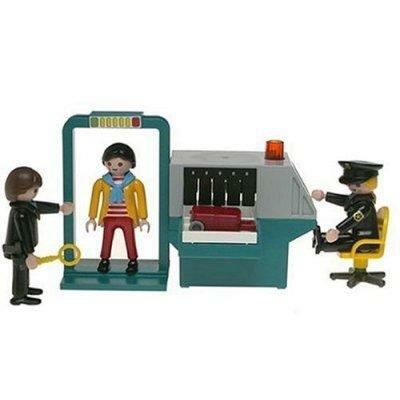 In a sign of the times, Playmobil has a new toy set out for children: The Security Checkpoint play set! The woman traveler stops by the security checkpoint. After placing her luggage on the screening machine, the airport employee checks her baggage. The traveler hands her spare change and watch to the security guard and proceeds through the metal detector. With no time to spare, she picks up her luggage and hurries to board her flight! Thank you Playmobil for allowing me to teach my 5-year old the importance of recognizing what a failing bureaucracy in a ever growing fascist state looks like. Sometimes it's a hard lesson for kids to learn because not all pigs carry billy clubs and wear body armor. I applaud the people who created this toy for finally being hip to our changing times. Little children need to be aware that not all smiling faces and uniforms are friendly. I noticed that my child is now more interested in current events. Just the other day he asked me why we had to forfeit so much of our liberties and personal freedoms and I had to answer "well, it's because the terrorists have already won". Yes, they have won. 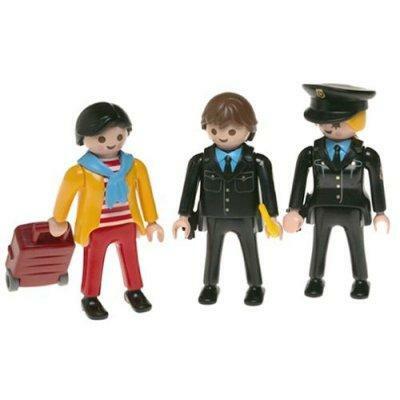 I also highly recommend the Playmobil "farm fencing" so you can take your escorted airline passenger away and fence him behind bars as if he were in Guantanamo Bay. This is great learning too for young brownshirts. I am waiting for a few accessories though, kids size jackboots and a toy Taser. Think how much fun that will be for your young Martin Bormann types. I envision a low voltage say 5KV instead of 50kv to give a realistic but non-hazardous jolt. Be the first on your block. I also look forward to the upcoming Halliburton Play detention center real simulated barbed wire. 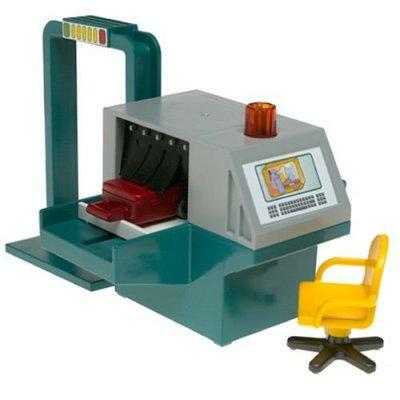 I guess its better than the "Cavity Search Playset"
Nothing is better than the Cavity Search playset. I thought this was a spoof... Wrong. I was reading some of the comments made about this "alleged" toy that's now on the market and came across one that said that terrorist's had won? Won what? First of all, terrorism is not the problem that the government makes it out to be people….check this out, according to the State Departments annual reports on terrorism since about the mid-80's there has NEVER been more than 10,000 deaths worldwide from terrorist attacks. Now granted, every person's life is important and even the 203 people that were killed world wide in 2003 were important and dear to many people, but 203 people doesn't sound like the terrorist's are winning. If you want to talk about people winning, let's look at the amount of deaths from cigarette smoking, not even per year, per day! The number surpasses the number of people killed by cigarette's greatly! So please don't say that the terrorist's have won. It's the government. They want you to be afraid and think that terrorism is this MAJOR killer of Americans every day, but it's just not the case. The government spends millions upon Billions of dollars on our military so we can be "safe" from a threat that isn't real? No. They spend that money so we can gulp down some of that luscious black gold, known as Oil. So whether this toy is real or fake, terrorism has not won, the government has by scaring you shitless of an unreal problem. Here's a website to back up my rant. Have a nice day. The terrorist victory is not in the number of deaths they cause, but in the fear they have elicited from the government. This fear causes the government to become suspicious of it's own citizens, and thus strip them of their liberties. Whats next ? am i going to see a drug raid play set? f*cking dea action figures? atf costumes for Halloween? just like pearl harbor. the gov knew before. the big biz has won. no limits on how much to raise prices, and turning the u.s. into a corporate run country.